When it comes to releasing free and addictive mobile slots games, Spin Genie really doesn’t fail to give casino enthusiasts what they are looking for. However, their acquisition of the hybrid bingo-slots game, Slingo Riches, clearly show the immense importance that they place on innovating and levelling up their users’ casino experience. Riches’ popularity was apparent from the start. Its humble Facebook beginnings did not stop it from gaining a huge following, which has since grown to millions. And catching the eye and favour of the panelists at the ICE 2015 ‘Game Design & Development’ Conference, where it was chosen as the “Game to Watch in 2015”, only serves as icing on the cake. Perhaps the majority of the reasons behind Slingo Riches’ success could be attributed to its simple, straightforward, and fast gameplay. Much like traditional bingo, the user is given a 5×5 grid with random numbers on each tile. The casino aspect comes in the form of the 5-reel slots located directly below the grid. First, you have to place the amount that you intend to bet. You can bet for a minimum of 50p up to a maximum of £100. With every roll, you have to match the numbers on the grid with the numbers that appear on the reel. Once you hit a matching number, it would automatically be marked off and changed into a ‘Star’ symbol. Getting 5 straight stars vertically, diagonally, or horizontally would earn you a Slingo. The more Slingos you hit, the more you’ll climb the win meter next to the grid, to get to a coveted Full House win. That’s how simple this game is! And to think that you can win and multiply real money with it! 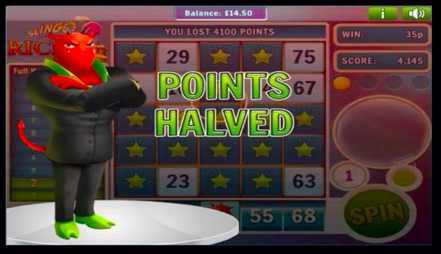 Or take a look at the https://www.youtube.com/watch?v=27T8dQmwqKg video for even better Slingo Slots Action! 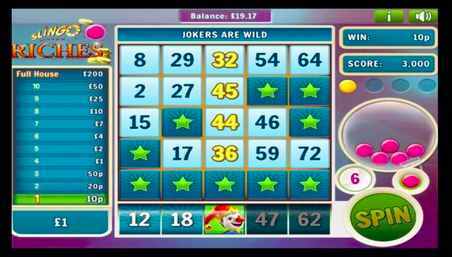 To make things better are the perks that you can get as you play, like the Joker, which could mark off any number in a column, and its superior version, the Super Joker, which could mark off any number in the whole grid! Discover other perks like the Cherub, Devil, and Coin and find out the goodies that you can acquire from them! Now this is where the Spin Genie magic comes in. Lots of online casino fanatics are aware of just how magnanimous this mobile casino is when it comes to giving out a free casino bonus or two. Not only will you be given 50 FREE SPINS once you sign up as a new member, but you could also expect your initial first and second deposits to receive 100% and 50% bonuses respectively! What could possibly be stopping you from giving Slingo Riches a try? Sign up now, download the free mobile casino App, and start testing your skill and luck in this one-a-kind free mobile casino app!